From about 1750 to 1850 lead mining was big business and Britain was the world's leading producer. The North Pennine lead field comprising Teesdale, Weardale, South Tynedale and the Derwent valley formed the most important lead producing area in the country. Lead mining was also carried out in the Yorkshire dales, particularly in neighbouring Swaledale and Arkengarthdale. There is evidence that the Romans mined lead in the region and during the later Anglo-Saxon age Bede records that lead miners from Swaledale often haggled with Catterick merchants over the price of lead. The Prince Bishops of Durham exploited lead and silver deposits in Durham's dales while monasteries mined and smelted lead in the Yorkshire Dales. In Henry II's reign lead was shipped from South Tynedale to Windsor and from at least 1400 German metallurgists introduced new lead extracting skills to the North. In the 16th century Sir William Bowes owned extensive lead mining interests in Teesdale and Weardale and operated a smelting mill but it was not until the late 17th century that the industry really developed. The Blacketts, a Tyneside coal owning family were mining lead in the Allendales near Hexham in 1684. A few years later they leased land in Weardale from the Bishop of Durham. Lead mines owned by the Blacketts included Burtree Pasture in Weardale, Coalcleugh in the West Allen, and Allenheads Mine. The London Lead Company was mining around Alston from 1696 and in the following century extensively mined in the Derwent Valley, Weardale and Teesdale. The company was noted for its social welfare and built houses, schools and libraries for its workers. It was the first company to introduce the five day week. From 1880 Middleton in Teesdale was its northern headquarters. The company operated Teesdale mines until it folded in 1905. Growing towns and the industrial revolution stimulated the demand for lead for use in roofing, piping, casting, building materials, lead shot, paint-bases and glazing. Lead works began to open on Tyneside at places like Elswick, Hebburn, Blaydon, Bill Quay and Byker Bridge. Newcastle was the main point of export for lead from the Durham dales (including Teesdale), but Stockton was often used for exporting Swaledale lead. Until the growth of dales railways around 1860 lead was usually carried to port by teams of Galloway ponies along packhorse routes. The earliest methods of extracting lead were simple bell pits or through Hushing, an open cast technique. Hushing involved damming streams and then releasing the water by directing it into a man-made trench in order to remove vast quantities of peat and soil from suspected layers of lead. This created artificial valleys up to half a mile long and sometimes as deep as 100 feet. Many can still be seen in the lead mining dales of the region, particularly Weardale. By the late eighteenth century the preferred method of mining was to dig stone tunnelled shafts called Levels into the hillsides along a vein. The lead was hauled from the mines along wooden rails (later iron) by horses. Lead mines were well drained and much safer than coal mines in terms of flooding. The lead ore was stripped of its waste products outside the mines, often by boys and then washed and crushed before transportation to a smelting mill where the lead would be produced in the form of ingots along with any silver. 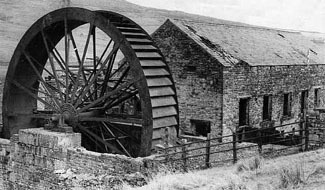 Smelting mills were erected throughout the dales and served several mines. Horizontal condensing tunnels were often built such as the mid nineteenth century Rookhope Chimney. Here a two mile long horizontal tunnel eventually led to a vertical chimney. It served partly to redirect polluting fumes away from the workers but also allowed the formation of lead and silver deposits from the fumes to collect on the walls which were scraped free and collected by lead workers. In the late eighteenth and early nineteenth century hydraulic machinery was extensively used in mines, on dressing floors and smelt mills and there was an extensive network of man made mill races streams and channels. Water power was increasingly used in the 1870s. Weardale's Kilhope Mine (opened 1860) saw the introduction of a great 30 feet diameter wheel in 1878 by Blackett Beaumont. It hauled tubs of ore up to the crushing mill while other wheels worked the crushing machines, jiggers, buddles and separators. Mill races drove the wheels and the mill race was linked to other plants at Burtree Pasture and Westgate. The lead-ore from mines in Allendale and Weardale were particularly rich in silver in the early nineteenth century but by the end of the 19th century they had been thoroughly worked. One of the most important silver mines was that at Allenheads between Stanhope and Alston. It was closed in 1896, but was once the largest silver mine in the world. Silver could be extracted from the lead ore (when it was present) using a special process caled crystalization which was developed at Blackett's Lead Works at Blaydon on Tyne in 1833. By the 1850s, the best lead ore was removed in Britain and cheaper ore was available from the United States, Germany and most significantly from Spain. Ironically, many of these foreign developments were backed with British capital and expertise. Many Northern mines closed in the 1870s and some miners sought work abroad, notably in the United States. Lead mining companies folded or sold their interests to new companies like the Weardale Lead Company of 1883. This company continued mining at places like Rookhope and although some mines continued operating until the 1930s, others reopened during World War One. Lead Mining was virtually dead by the 1900s, the only consolation being that former lead mining waste products like Witherites, Barytes and Flurospar acquired commercial uses in the twentieth century.